Ceramic Tile Saw Details - Quasius Equipment, Inc.
Our Felker Tile Master professional ceramic tile saws are very popular machines with professional and do-it-yourself users alike. The powerful 1.5HP motor turns a 10" diameter continuous rim diamond blade to give the best possible cutting performance. The water pump will pump water out of the easily drained tray to hold down dust and keep the blade cool. The sliding tray lets the operator feed the tile through at a controlled rate for accurate and smooth cutting. The open design of the 12" x 17-1/4" table lets you cut up to a 13" x 13" tile diagonally or rip cuts up to 19". These compact units can be easily transported in most vehicles and can be set up anywhere to do your cutting. You'll need a 20 amp circuit to run it, as well as some water to fill the tub. The saw easily cleans up with a garden hose when the job is over. 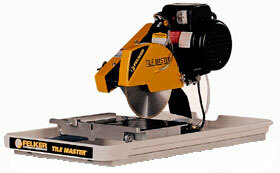 The 10" diameter diamond blade is included with the saw at no extra charge and is designed to cut ceramic tile only. If you need to cut porcelain tile or glass tile we have an optional 10" Porcelain Tile Blade or 10" Glass tile blade available at minimal charge. If your tiles are large, our Large Size Ceramic Tile Saw handles tiles up to 18" square with ease.